A fabulous team dinner at Ox Restaurant wasn't our only meal in Portland, oh no. We Urbered far and wide and had two more pretty great dinners in the city. Olympic Provisons, which is lately calling itself Olympia Provisions owing to some squabble with the International Olympic Committee,mwhich I find hilarious. 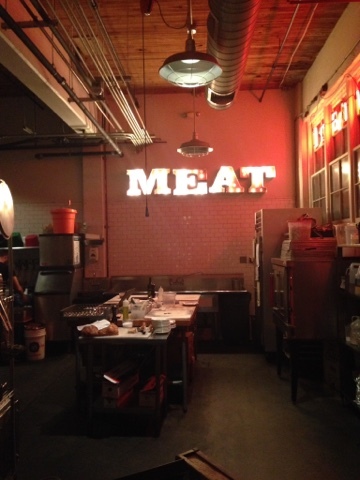 Are The Olympics really worried about a Portlandian meat emporium interfering with its brand? Ok, sports people. Whatever you say. The night we visited Olympic Provisons, a couple members of our party were perhaps more hungry and worn out from a day standing and pressing the flesh at a trade show than an adventuresome, hipstery dining experience could bear. We called ahead for a table, and arrived when the hostess thought one would become available, but that party elected to stay for dessert and lingered over drinks. Rather than allow our group to break up into two tables, the polite but slightly inflexible young lady insisted we wait. We lost one diner to sheer exhaustion and ended up sitting at the counter, which suited me just fine, since it afforded a view of the line, open to the dining room. By the time we were seated, at nearly 9 pm (and remember, some of us were still on East Coast time), our party chose to skip the admittedly delicious-sounding appetizers and go straight for entrees. 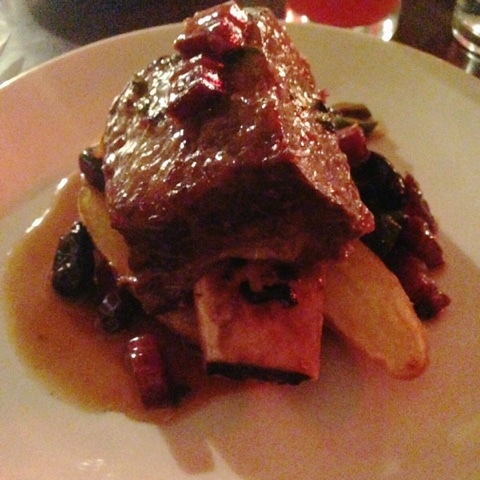 My short ribs were downright fabulous, and it was educational and fun to watch the dish prepared right in front of me. The meat itself was perfectly seasoned, juicy and tender, and the slabs of potato underneath were the ideal roasted spud: with a delicate crisp outside and fluffy, earthy insides. But the surprise here was the extras: briny olives and crunchy fried lardon added pork fat and selenity to the taste profile, for a comforting yet still unique dish. 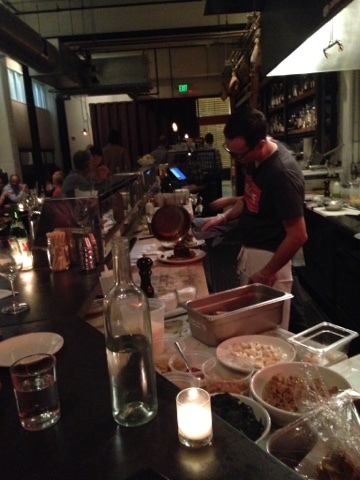 I didn't get to try a variety of the food at Olympic Provisions, but what I did try, I adored. It's worth checking out if you're up for a leisurely night of good food and drinks. Our last night in town, we hit up Mother's Bistro based on recommendations on Trip Advisor. This downtown bar and restaurant is much like what I've always imagined opening: multiple, intimate dining rooms furnished with a mix of homey antiques and crystal chandeliers, a menu focused on classic American dishes made in their ultimate iterations, and service so friendly and casual, you think you're at a friend's house. 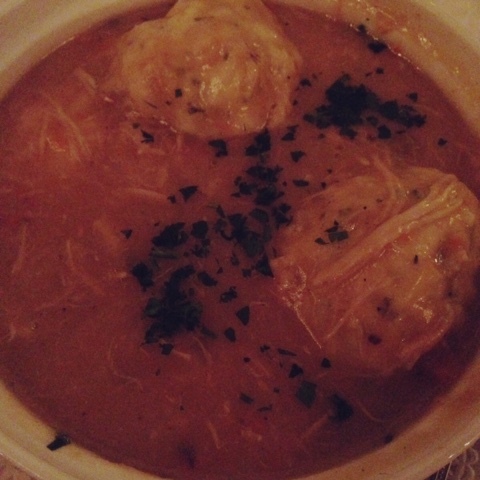 After a massive basket of rolls and biscuits to share and and a delectable cup of matzo ball soup dominated by a tender, slightly salty matzo ball - the tastiest one I've ever eaten - I dove into this gigantic bowl of chicken and dumplings. Imagine the best Thanksgiving gravy you've ever had. That's what the sauce in this dish reminded me of - deeply flavored with roasted chicken and aromatics, well seasoned but not salty. Lisa Schroeder, the "mother" at Mother's, came out, and we all heaped praise on her. She's doing something special and real and decidedly un-hipster in this town full of flannel, tattoos and ironic mustaches. Her food is hearty, nuanced but not tortured into submission, and well, really yummy. It's not fussy, it's certainly not neuveau, but you will leave Mother's house full and happy. Enough said. After leaving Portland, my friend Jenn and I continued on to Seattle, and ate at famed The Walrus and the Carpentar, so check back in next week for a peek at what we got up to in the Emerald City! My personality is big; my hunger is bigger! Thank you so much for the sweet words!!! We so appreciate it! Wow, Olympic Provisions and then Mother's. Two wonderful, and yet so different, restaurants. Both under-appreciated in the local food scene. Very good choices. Many halls are created to provide a catering service to specific cultural needs. And it gets very difficult to have a party at a hotel because the catering staff could not cook the traditional meals required by the client. But the party venues specialize in specific cultural needs.